You should not use the information on this website for diagnosing or treating a medical or health condition on your own. All decisions regarding patient care should be made with your healthcare provider. There is no permanent cure for Delayed Sleep-Phase Syndrome or Non-24-hour Sleep-Wake Disorder. The suggested treatments only provide ways to try to manage the condition. Often, several of these treatments are used together. They can be successful, at least partially, with some patients. But for others there is no improvement, and social and work patterns must be adjusted to accommodate the delayed schedule of the patient, or physical deterioration and mental dysfunction results. Even when one's sleep time can be shifted, there is often an impact on mental functioning. Disclaimer: We simply post suggestions we receive from patients. We do not have first-hand knowledge of these doctors, and cannot be held responsible for bad suggestions or errors in posted information. if you find errors or broken links, or if you have a good sleep specialist to suggest. The prerequisite step in any case is to follow good "sleep hygiene", although for people with DSPS or Non-24 this is generally not sufficient to normalize their schedule. Have a comfortable bedroom, dark and quiet. If light is a problem, use heavy curtains over the windows. Reserve the bedroom for sleeping. Do not use it for watching TV. Avoid caffeine within 6 - 8 hours of bedtime. Avoid alcohol: while alcohol may help one to fall asleep initially, it generally causes the restorative quality of sleep to suffer. Avoid computer screens and phone screens shortly before bed. Do not do any serious exercise for three hours before bedtime. Relax for a while before going to sleep. Avoid naps in the evening. Go to bed at the same time every night, and get up at the same time every day, seven days a week, so that your body has a better chance of adapting to the desired schedule. This is of particular importance for people with circadian sleep disorders. The most successful method of shifting one's sleep schedule seems to be exposure to bright light first thing in the morning. This can be achieved by going out in the sunlight, or by sitting in front of a bright light designed for this purpose (typical room lighting is not nearly bright enough). Such lights are also used for treating Seasonal Affective Disorder (SAD), and are commercially available (see list below). It is important to use a light that has the ultraviolet components filtered out, or eye damage can result. Recommended exposure is 10,000 lux for between ½ and 2 hours. The 10,000 lux is important. Lower intensity requires much longer exposure. It is important to note that the intensity is a function of how far your eyes are from the light: sit twice as far away, and the intensity is typically only one quarter as much! (see our Introduction to Lux.) The commercially available lights intended for this purpose are rated, for example "10,000 lux at 12 inches". In that case your eyes should be 12 inches from the light. It is meaningless to say a particular light "is" 10,000 lux. It is only that bright at some particular distance. Needless to say, the light must fall on your eyes, though you do not have to look directly into it. The timing of the light exposure is critical. There is a point during the body's sleeping period, such that exposure before that time (for example in the evening) will delay the sleep cycle even further, but exposure after that time (in the morning) will advance it (move it earlier). The closer to that time one gets the light, the more effective it is. The general rule is to sit in front of the light immediately on arising. Some have suggested getting up an hour earlier to sit in front of the light, and then going back to sleep. The exact effect of light at different times of the day is expressed by the Phase Response Curve (PRC), which is described here, and in the delayed2sleep blog. We are being sloppy when we say "first thing in the morning". Is this "morning" as society defines it, for people with daytime jobs? Or is this your body's idea of "morning", which might be at 2:00 pm for many DSPS people? Many doctors gloss over this also. Basically, it is not a good idea to use the lights many hours before your natural wake time, because that risks exposure at a time when it can delay your body clock even further. Instead, move your rise time gradually. For example, get up an hour before your natural rise time and use the lights. Stay on this schedule for several days until your body adjusts to the new rise time. Once you feel comfortable with this, go another hour earlier. For sighted non-24 people it would make the most sense to wait until your natural sleep cycle rolls around to where you want it to be, and then start using light therapy when you get up. How effective is this treatment? Many have reported sufficient improvement that they are able to function reasonably well on a traditional 9-to-5 work schedule. Others find that after a while on a normal schedule they seem disoriented, disconnected from the world. Some find it helps partially, and are able to advance their schedule an hour or two but not more. It is possible that some non-24 people might find it easier to entrain to a 24 hour cycle that is later in the day, rather than society's conventional daytime hours. In addition, some people report side effects, such as feeling hyperactive after the light exposure. Shortening the exposure may fix that. Others report eye pain or puffiness, or headaches, including migraines. These people must move the therapy to a later time, where it is less effective, or abandon it entirely. Are there long-term risks? Some researchers have raised the possibility that exposure to bright light containing blue wavelengths (which are needed to reset the body clock) may increase the risk of macular degeneration. This would be more of a problem for older people who may have less of the compounds that normally protect against damage. To our knowledge, such increased risk has not been shown in humans. Research is ongoing. Akash, M, Soma, H, Yamamoto, T, et al, Noninvasive method for assessing the human circadian clock using hair follicle cells (2010) - notes that "the 3-wk adaptation period is not enough to advance the phase of the molecular clock by 4 h"
Many people are extremely sensitive to evening light, so that even low levels of blue or blue-green light late in their day can delay their circadian clock. This includes the light from a TV or computer screen. These people find they may be able to get to sleep earlier if they restrict their exposure to light for several hours before bedtime. Some find it necessary to have only very dim lighting in their homes, and to avoid any exposure to TV or computer or phone screens. It is thought that even brief exposure to light during this time may have outsized effects for these people. Another strategy is to filter out the blue light which is primarily responsible for shifting the body's clock, for several hours before bedtime. This can be done by wearing blue-blocking glasses. Computer screens can be covered with a screen that filters out blue light, such as ruby lith. There is also software that removes some of the blue from your computer screen at night. One such program is called f.lux. Current research strongly suggests that light therapy should be combined with dark therapy for it to be effective. Reading Glasses Etc - look for "BPI 500"
Most of these still have some blue, so they are not recommended as part of serious dark therapy, but they may be of interest in automatically reducing exposure to blue wavelengths at night. We have not evaluated these products. Melatonin is a hormone produced naturally by the pineal gland in the brain. Its concentration varies in a daily cycle, and is higher during the hours of sleep, and lower during wakefulness. Melatonin has typically been recommended by doctors to assist in advancing (making earlier) people's sleep times. The usual timing is to take it from ½ to 2 hours before the desired sleep time. Recommended dose is typically between 1 and 3 mg, and some doctors prescribe even higher doses. But some people appear to achieve useful effects with as little as 0.1 mg (100 micrograms), and may experience a hangover on higher doses. Both the timing and the dose need to be adjusted on an individual basis, as the same dose in different people can give rise to 35-fold differences in blood level (see the Aldhous and the Waldhauser references below). Emens and Eastman (reference below) note, "Higher doses of melatonin result in elevated melatonin levels for many hours and can simultaneously stimulate both the phase advance and phase delay regions of the melatonin PRCs, thereby causing both phase advances and phase delays and ultimately resulting in a smaller net resetting effect." But research indicates that to be most effective in advancing one's circadian rhythm one should take it much earlier, and in doses small enough not to feel sleepy right away. Four to eight hours before desired sleep time has been reported as optimal. We note that there are two effects of melatonin on sleep: it makes you sleepy (hypnotic effect) and it advances your circadian rhythm (chronobiotic effect). Used as a hypnotic, one takes it shortly before desired sleep time. But used as a chronobiotic, it may be more effective if taken earlier. For DSPD, the recommendation is to start on your body's natural schedule, taking melatonin 4 - 8 hours before your natural bedtime. If you then get tired earlier, move your schedule an hour earlier and take the melatonin an hour earlier. Let it stabilize. Then move another hour earlier. Keep doing this until you achieve your desired schedule. For people with non-24 it makes the most sense to wait until your natural sleep cycle rolls around to where you want it to be, and then start using melatonin 4 - 8 hours before bedtime. Many people report side effects from taking melatonin, especially with the larger doses. Some feel groggy and hung over the next day. Nightmares, vivid dreams and depression are often noted. A few report migraine attacks or other mood changes. In these cases, lowering the dose may minimize the side effect. A few people report increased restlessness and poor sleep. For them this therapy may have little value. Also, there is little data on long-term effects. For example, it is not known whether taking melatonin for years would make it difficult to fall asleep without it. Melatonin is illegal in some countries. In some others it may be available only on a specialist's prescription. In the United States it is legal and available over the counter, but it is unregulated. Buy from a respected manufacturer to be sure you are getting what is on the label. In some European countries it may be difficult to obtain by prescription, but may be available without a prescription as a "dietary supplement". 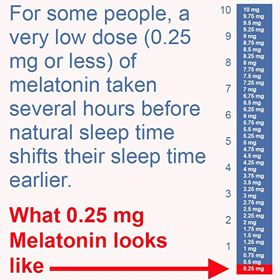 Note that while melatonin may be of help in shifting one's circadian rhythms, this is not true of many commonly prescribed sleeping pills. In addition, most other sleeping pills result in habituation, a lessened effect for the same dose, after taking them for a period of time. Tasimelteon (Hetlioz®) - FDA (US) approved 2014 for the treatment of adults with non-24-hour sleep-wake disorder. The (U.S.) FDA prescribing information (https://www.accessdata.fda.gov/drugsatfda_docs/label/2014/205677s000lbl.pdf) does not restrict its use to blind patients. Also Circadin®, a 2 mg prolonged release form of melatonin, was approved in Europe in 2010 for use for 13 weeks for insomnia patients over 55 years of age. Caution: melatonin supplements may worsen nocturnal asthma. See this WebMD article, based on research by Sutherland et al referenced below. We have not used or evaluated these sources. We list them alphabetically. Note that other doses may be available if you look further. We have not used or evaluated these sources. See your doctor to order these tests. Over half of all totally blind (no light perception) people suffer from non-24. Since light is the major contributor to entrainment in sighted individuals, it seems clear that the blindness itself is the underlying cause of non-24 in the blind. This is in contrast to sighted non-24, where several underlying causes have been proposed, but none are well understood. For those without any light perception it must be expected that light therapy and evening light restriction are not relevant. The main remaining treatment is melatonin and melatonin agonists. See the discussion and references in the previous section. Experience has shown that it is often not possible for a person with DSPS to shift his sleep time earlier, at least not as much earlier as desired, even with bright light and melatonin. In the most common form of chronotherapy he is asked to shift his sleep time later instead. Typically, sleep time is shifted three hours later each day, all the way around the clock, until the desired schedule is reached. This procedure seems achievable for the patient, but he will be living a very unusual schedule during the process, and generally would require some time off from work. The real difficulty comes with sticking to the new schedule. The patient must rigorously maintain the new schedule, seven days a week, for as long as he wants to be on it. Any delay in getting to bed, even for one night, is likely to allow his body clock to shift later, and make it difficult to impossible to shift earlier again. This then necessitates repeating the whole around-the-clock process again. As a result, there are no late nights out with friends, no staying up with a sick child, no burning the midnight oil trying to meet a school or work deadline. In practice, most people find such an exacting schedule impossible to adhere to in the long run, and so the chronotherapy ultimately fails. Additionally, some DSPS people find that the early (for them) schedule feels unnatural and disorienting, and they cannot perform their best work while on such a schedule. WARNING: There is data (see the Oren reference below) indicating that phase-delay chronotherapy for DSPS can lead to Non-24-Hour Sleep-Wake Disorder, which may be far more difficult to live with. In other words, where one has started with a delayed schedule which is the same every day, one may end up with a schedule that shifts later and later every day, around the clock. Where one initially could work a night job but not a day job, one can no longer work any job that requires regular hours. This is further supported by the Scheer reference and discussed in the Fadden video and document. Note: we have used the term phase-delay chronotherapy to emphasize that it is chronotherapy in the very specific sense introduced in the Czeisler paper (below), and used for example in Section 12.4.1 of the American Academy of Sleep Medicine review paper (2007). In this sense the sleep schedule is progressively delayed until the desired sleep time has been reached. Some authors have used the term "chronotherapy" by itself to mean any prescribed procedure for resetting the body clock. Additionally, the term is sometimes used to refer to administration of medication or other therapy in accordance with the patient's circadian rhythm. We are sorry for this confusion. Another approach has also been reported, called Sleep Deprivation Phase Advance. This involves staying up around the clock and then going to bed 90 minutes earlier than the patient's previous sleep time. Let the new time stabilize, and repeat. The same difficulties maintaining the new schedule apply. There is disagreement on whether this approach is suitable, as there is evidence that sleep deprivation may actually cause further phase delay (see e.g. the Cajochen article below). Some doctors prescribe hypnotics ("sleeping pills") to help patients fall asleep at their desired time. Examples of these are Ambien (zolpidem), Lunesta (eszopiclone), and Sonata (zaleplon). While these may help patients feel better, they are not an effective long-term treatment. Many patients report habituation, needing to increase the dose after a while to continue achieving the same effect. Even in the short term there is little information on dosage and timing needed to produce a circadian phase shift. There is also some question whether a hypnotic, taken at a time that's not in sync with your circadian rhythm, provides restorative sleep. Suvorexant is a new type of sleeping pill, with a different mechanism of action (see the reference below). We have no further insight at this time. Stimulants may also be prescribed to increase alertness during the day. These include Provigil (modafinil), Nuvigil (armodafinil), or Ritalin (methylphenidate). Their use in shifting circadian rhythm is not well studied, and they are not normally prescribed for this purpose. Some patients have symptoms of hypersomnia as well as a circadian rhythm disorder, and for them using a stimulant medication may be particularly important.. Some have suggested large doses of vitamin B12. One of our members discusses the history of this here. Others have mentioned acupuncture. Other medications have been tried as well, for example aripiprazole (Abilify). Exercise can shift the clock too. We have not evaluated any of these. A lot of people are helped by the treatments above. But treatment does not work for everyone. Here are some thoughts on Why Treatment May Not Work For You. People for whom treatment is ineffective often deal with their circadian rhythm disorders by sleeping on their body's natural schedule, finding a career or lifestyle in which they can do so.